After an extraction, an open wound is created that must heal in a moist, bacterial ladened environment. Our bodies have a miraculous ability to achieve healing in such an environment, but a few precautions should be followed to prevent any complications. 1. To stop bleeding, patients should keep gauze at the extraction site and apply pressure by biting. If a tooth is not on the opposite arch to apply this pressure, a larger wad of gauze is probably in order. Just make sure there is pressure on the gauze and in some rare instances, finger pressure may be required. 2. Do not remove the gauze before they are soaked with blood and saliva. Removing a somewhat dry gauze from over an extraction site can pull the developing clot out of the socket. This in turn can cause a dry socket--a painful infection of the tooth socket. Waiting at least 20 minutes before removing the gauze will ensure that the clot does not stick to the gauze. 3. "Sucking" on the socket can remove the clot as well. Avoid doing this. The blood must remain in the socket so that a clot will form. This clot is instrumental in stopping bleeding and healing the bone. 4. The use of a straw is not advised for 24 to 48 hours after extraction. The negative pressure, of sucking that must be used with a straw, can dislodge the delicate clot in the socket. Patients will feel a sensation in the socket when such negative pressure in created in the mouth. Avoid any activity that creates such a sensation. 5. The use of carbonated beverage should be avoided on the day of extraction. Some suggest the carbonation can effect the clot. This is unlikely, but prudence suggests avoiding these beverage for 24 hours after extraction to avoid painful dry sockets. 6. Gauze changes, at 20-30 minute intervals is suggested. The typical socket, after 4 to 6 gauze changes, will have stopped bleeding. Only some minor "oozing" will remain. It is safe to remove the gauze once this is achieved. 7. In some instances, a "liver clot" can occur. This is a malformed clot in the socket. It appears dark red and gel-like. It appearance is similar to a piece of liver--hence the name. This clot can prevent good blood clotting and should be carefully removed. It will cause the socket to bleed more, but the same gauze placement and pressure will help to stop the bleeding. 8. Smoking should be avoided for AT LEAST 24 hours after an extraction. The negative pressure created during cigarette/cigar/pipe smoking creates is to be avoided. In addition, a host of undesireable chemicals in the smoke can also inhibit healing of the site. Smokers heal slower than those who are non-smokers. Nicotine patches worn at the time of extraction can help in this matter. 10. Oral care should be maintained. Carefully brush the teeth adjacent to the extraction site. 11. Rinsing with anything (salt water, hydrogen peroxide, Listerine, alcohol mouthwashes, etc.) should be avoided in the first 48 hours. There is no significant benefit to rinsing and some of these rinses can actually cause cell damage at the extraction site--extending healing. 12. Avoid impacting food in the socket. Should food get into the socket, CAREFULLY remove it, but be aware that a well formed clot looks gray, fibrous and somewhat like food. Be sure that its food and not the clot itself. 13. A dry socket (alveolar osteitis) is an infection that occurs in a socket that has lost its clot. It is characterized by a pain that sets in 3 to 6 days after the extraction and worsens. An foul odor often accompanies the dry socket. Contact your dentist if you think you are developing such a condition for appropriate treatment. 14. Pain medication is rarely required for an uncomplicated extraction. Some patients may require a dose or two of over the counter pain medication, like ibuprofen, to alleviate some minor sensations. Your dentist will determine whether or not stronger narcotic pain medication is necessary. Should pain be unbearable and uncontrollable with OTC medications, please call the office for something stronger. After hours contact: 904-860-8000. 15. Persistent bleeding sockets can sometimes be treated with a moist tea bag held on the socket. Tannic acid in the tea can help promote complete clotting. If bleeding does not stop within 8 hours, a clotting problem could exist. Please call your dentist. If you have followed all these directives and bleeding persists, you may need to proceed to a hospital emergency room to for blood tests to see if a underlying clotting problem is the root cause. 16. 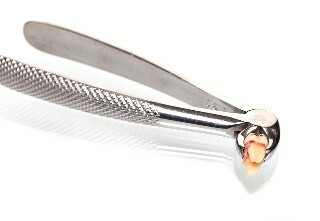 Extractions of primary (baby) teeth is typically uneventful. Children have a unique ability to heal quickly and usually do so without complication. However, parents must keep a close eye on children after an extraction to ensure that the bleeding stops and that the preceeding directives are carried out. Young children are often fascinated by the fact they can not feel their lip or tongue and they will chew on these numb tissues, wanting to see if they can feel something. This chewing can cause severe damage to the tissues. Also, just not knowing where the tongue and lip is because of the numbness can cause inadvertant damage. Please monitor your child while they are numb. If your child is experiencing some pain after extraction, the vast majority of children will only require over-the-counter analgesics like Children's Tylenol or Children's Motrin in weight appropriate doses.